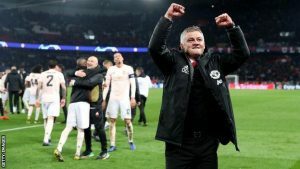 Marcus Rashford scored a nerveless injury-time penalty as Manchester United staged an incredible comeback to beat Paris St-Germain on away goals and reach the Champions League quarter-finals. Rashford thumped home the VAR-awarded spot-kick in the 94th minute after Diogo Dalot’s speculative shot struck Presnel Kimpembe on the arm. PSG went 3-1 ahead on aggregate when Kylian Mbappe fed a pass to the unmarked Juan Bernat, who slotted home at the back post. The hosts then had a succession of chances, with makeshift right-back Eric Bailly enduring a torrid time in his 35 minutes on the pitch, before injury saw him replaced by Dalot. The Norwegian has overseen a remarkable turnaround which has seen the side collect 14 victories from 17 games in all competitions, including away wins at Tottenham, Arsenal, Chelsea and now PSG. The former United striker has not only brought back the smiles to a side that was so abject before Christmas, but done so with outstanding tactical awareness and without the services of 10 first-team players. Paul Pogba’s red card in the first leg meant he sat out the game alongside the nine injured players, so Bailly was given a start at right-back. However, the Ivorian turned in a wretched performance and was caught out of position time and time again. An apparent injury to Bailly allowed Solskjaer to rectify this by bringing on Dalot and United looked much more solid thereafter. And up front, the often maligned Lukaku worked tirelessly and took his tally to 15 for the season with two well-taken finishes. United have now won nine straight away games under Solskjaer and reached the last eight for the first time since 2014.